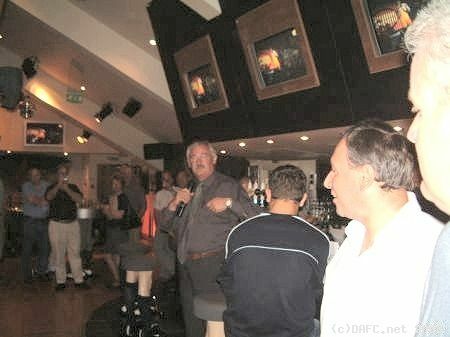 Jim re-introduces himself to Pars supporters! A good home crowd of 60 or so supporters were warmly welcomed to the Jock Stein lounge by the Chairman, John Yorkston, ably supported by his new General Manager and Executive Director, Jim Leishman, which got the meeting of to a flying start. The club officials then departing from the meeting to allow full and free discussion as they headed for official business in Legends bar! The meeting was the brainchild of lifelong Pars fans Rodney Shearer who felt the club, or rather its fans, needed to be part of the new movement of supporters trusts of which there are currently 21 in Scotland. A supporters trust is intended to give the fans a bigger voice in the running of the club and, in some cases, will also hold shares in the football club. Mike Barile from the Dundee United trust, the Arab Trust , gave a very comprehensive overview on what his trust had achieved in the past year. The Arab Trust has over 400 members who each pay �15 per annum (the amounts vary from trust to trust). Their trust holds shares in United and they have a representative on the Board of Directors. John Yorkston, gave a clear indication that, all going well, a similar board representation would be forthcoming at East End Park. The next speaker was James Proctor from the "Supporters Direct" organisation which assists and promotes the setting up of trusts which is a government funded initiative. James, despite being a "Wee Team" supporter, gave a lucid summary of the issues involved in creating a new trust and the challenges its steering committe would face. A period of questions and answers was followed by a vote with the fans present approving the creation of a trust, to be known as the "Pars Trust".